During the nineteenth century, the U.S. greatly expanded its territory by purchasing land from other countries, taking land from countries it defeated in war, and adding independent territories that wanted to become part of the United States. 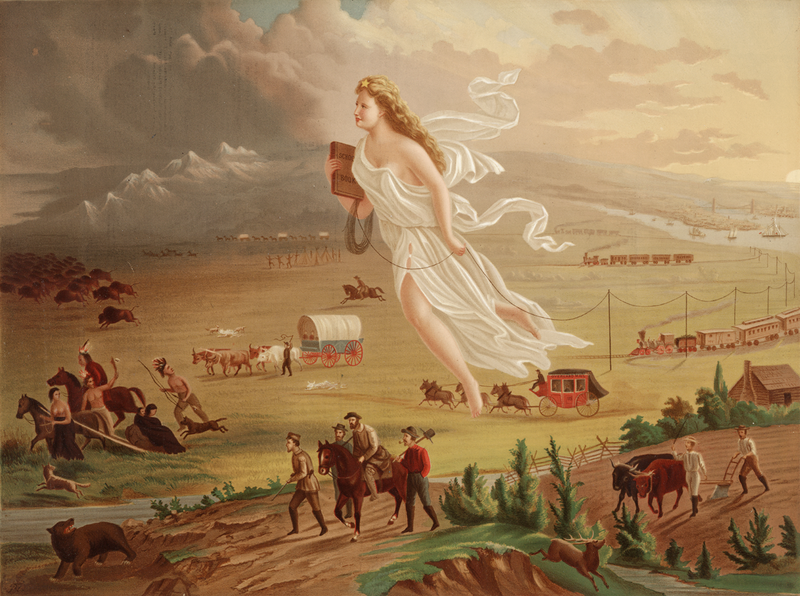 This illustration celebrated that territorial growth by using many popular symbols of American progress and westward expansion. It was produced as a chromolithograph in 1873, inspired by an 1872 painting by John Gast. Chromolithography was a method of mass producing images, making them inexpensive for people to buy and hang in their homes. Source | George A. Crofutt, American Progress; after John Gast, 1873, chromolithograph, The Library of Congress, Prints and Photographs Division, http://hdl.loc.gov/loc.pnp/ppmsca.09855. (original painting in The Gene Autry Museum of the American West, Los Angeles). Cite This document | George A. Crofutt, after John Gast, “"American Progress",” HERB: Resources for Teachers, accessed April 20, 2019, https://herb.ashp.cuny.edu/items/show/1187.